We avail this opportunity and take pleasure in introducing TPP Boilers Pvt. Ltd. as a Designer, Fabricator & Erectors of Boiler Components & Equipments made of steel plates or tubes or pipes. We are a small scale industry promoted by our good experienced CEO and CTO with workers participation all separated from an old (over 50 years) established Boiler Manufacturing and Erection Company. Hence we offer the expertise of a very Large Company with accessibility of a small company at very Reasonable Costs. Our Promoters and Promoter Workers have a very deep knowledge and wide experience of over 500 man-years in Fabrication, Erection, Bending & Welding of all kinds of Plates, Sections, Tubes and Pipes like Seamless, ERW, and Rifle-Bore made of any kinds of Steels like Carbon Steels, Alloy Steels, and Stainless Steels in any Size and Length and to any Specification. Manufacturing Facility: We have capacity to manufacture any equipment made from any type of steel having thickness of up to 50 mm. and any type/ pipe bending up to 100 mm NB (114.3 mm OD) x Sch 160 (33mm). All fabrication facilities are available using state of art manufacture Equipment at 4000 Sq. Mtr. Factory & innovation by our skilled manpower in Plate/ Tube Bending, Welding, Coiling, Assembling & Heat – Treatment allows fast delivery of component without reducing its quality requirement. We have excellent Managerial & Technical Personnel with support from a team of Engineer, Supervisor & of Skilled & semiskilled workers for site & factory jobs & design, production & Quality are maintained by our experts in their field. 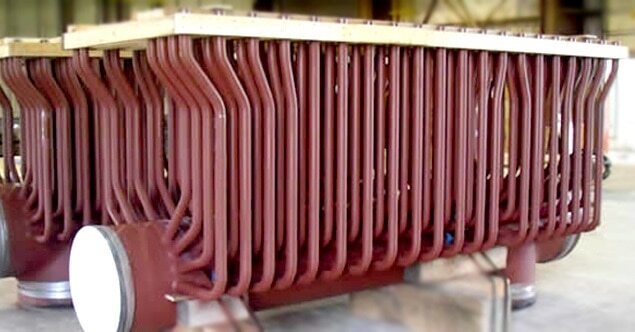 We also specialized in manufacture short radius tube bend with R > = 0.6D, Heat – Exchangers, Steam Piping, condensate piping, Exhaust gas Piping & any type ducting systems. All fabrication is done using state of art manufacturing facilities at our factory and our innovations in Plate/ Sections /Tube /Pipe-Bending, Rolling, Pressing, Drilling, Welding, Assembling and Heat-Treatment provides fast delivery of component without affecting its quality requirements. Quality: Our stringent Quality Control Process have been developed over many decades of experience of our Promoters in Fabrication and all operations are Serialized and subjected to 100% Check and Recorded for Traceability with the main area of focus being Raw Materials, Welding joints with Radiography/X-Rays, Dimensional Accuracy of all operations and Assembly Pressure Testing and finally Painting and Packing. We not only follow the latest Material and Fabrication codes like ASME, BSS, DIN, VGB,JIS,NF,GOST, ISO,EN etc. but we internally excel the requirements of these Codes.